VedicMaths.Org - 7 - The Vedic Square. Questions have been raised about this Square but it has not been easy to track down references. An Internet search revealed that it is used in Numerology and Astrology as well as for educational purposes. A reference to an article was also found: "Investigating the Vedic Square" by Nicola Woolf in a UK journal called Micro Math, Volume 11/3, autumn 1995. There are some pages (119-125) on the Vedic Square in the book "Multicultural Mathematics" by David Nelson, George Gheverghese Joseph and Julian Williams (published by Oxford University Press, 1993). This describes various patterns that occur in the Square and in particular the patterns that are produced by joining the ones in the table (or the twos, threes etc.). There is also a 2-page section in Book 3 of "The Cosmic Computer" course by Kenneth Williams and Mark Gaskell (published by Inspiration Books, 1998). This shows a method of drawing designs by choosing an angle of rotation (90 degrees when using square paper and 60 or 120 degrees when using triangular paper) and using a line in the Vedic Square to define a sequence of distances. So starting with the fourth row, say, of the Square (4,8,3,7,2,6,1,5,9) and using square paper you would choose a point on the paper and an initial direction and draw a line 4 units long. Then turn 90 degrees anticlockwise and go 8 units, then another 90 degrees and go 3 units, and so on. When reaching the end of a line in the Square you go back to the beginning and continue. A variety of very pleasing designs result from different choices of rotation angle and lines (rows, columns, diagonals etc.) in the Vedic Square. Each of the ideas mentioned above could be developed further in a number of ways, leading to different or more advanced applications of the Vedic Square. So the Square is very useful for teaching purposes as many skills can be developed by using the square in different ways. Many beautiful patterns in the Vedic Square have been uncovered by Barbara Salmon who has also found some marvellous relationships in the closely related Vedic Triangle. We hope to show something of this in a later Newsletter. The origin of the Square still remains a mystery however. Dr George Joseph, an expert on the history of Indian Mathematics at Manchester University, is not aware of any Vedic origin and some references suggest the Square was used in the Muslim tradition. In the UK the year 2000 is "Maths Year" and a letter is being sent to the Minister of Education, Mr David Blunkett, informing him about the significance and advantages of Vedic Mathematics and offering him a presentation of the system. If you have a responsible position in education and would like to add your name and/or ideas to the letter please let us know. An article entitled "Recurring Decimals - Vedic Style" by Andrew Stewart-Brown has been published in the journal "Mathematics Teaching" No. 170, March issue, pages 28,9. This is a publication of the Association of Teachers of Mathematics. The article clearly describes one of the most remarkable Vedic methods for converting fractions into their recurring decimal form and gives easy algebraic explanations. We hope to be able to put this onto the web site. The National Hindu Students Forum invited James Glover to give an introductory lecture on Vedic Mathematics at both Imperial College and University College, England last month. These popular talks gave a brief outline and history of development of the subject, together with examples of sutras working in recurring decimals, algebraic division, the binomial theorem and calculus. The students appeared to be astounded by the simplicity of apparently complex mathematics and the flexibility of the system. There were many questions, the most prominent being, "Why is this not more widely known about?". >From Howard Chester: just a note to let you know how successful was a talk which Andrew Nicholas gave recently to teachers in Richmond upon Thames, England. Andrew spoke about his system of geometry based on a visual and oral approach to proof. In the audience were both primary and secondary teachers of mathematics, who were interested to see how the approach could be used successfully in the classroom. Andrew's approach is one of intellectual rigour, whilst being very accessible to those with a non-mathematical background. We found the talk very interesting and would very much recommend it to you. Andrew has also given talks more recently, during his visit to the US. Andrew Stewart-Brown is giving a presentation on Division by Vedic methods at the annual ATM conference 17-20th April at Westminster College, Oxford, England. James Glover will be giving further Vedic Mathematics talks in May at St Georges Hospital Medical School and North London Collegiate Girls School. A book entitled "Astronomical Applications of Vedic Mathematics" by Kenneth Williams is now available. This covers Prediction of Eclipses, Solution of Kepler's Equation, Spherical Triangles, Prediction of Planetary Positions etc. More information can be found on the .com web site. Our Singapore office has also made arrangements for payment to be accepted via major credit cards with an agency in the U.S. for any book purchase, with immediate effect. 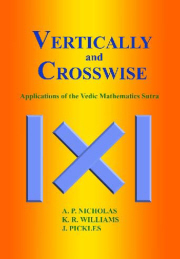 Please visit their web site for details at http://www.vedicmathematics.com. All orders will be shipped via Federal Express. Customers will be billed in US$. Acceptance and approval is online and immediate. Orders will be fulfilled much more quickly with this facility compared to payments by cheque/bank draft/money order. Please confirm the latest prices and actual shipping costs by e-mail before proceeding with the credit card payment. Reply e-mail will be almost immediate. Payment by this method is completely secure and is managed by an established international agency, "i-Escrow". The e-mail confirmation will give you the exact amount that would be deducted through your credit card. The web sites continue to be very popular: the .org site getting 30-40+ visits per day. The Calendar of Events page is kept up to date so please take a look if you want to see if there is going to be an event near you. And please inform us of any talks/course etc. that you know about, giving full details, so that we can put them on the page.